The holiday season is in full swing and that means you’re wallet is probably getting a lot of action. In fact, the National Retail Federation found that consumers are planning to spend over $960 this year on gifts, decor and other holiday purchases. Unfortunately, many consumers rely on their credit cards to afford these costs and end up in debt come January. This is why it’s more important than ever to shop smart. However, finding the best deals can feel overwhelming because there are so many options both in store and online. Here are some tips I shared on New Day NW in Seattle about how you can navigate the sea of deal clutter to find real savings and score deeper discounts. Set gift expectations. The first thing you need to do before you go shopping is to set gift expectations with family and friends. This is a good time to suggest drawing names or a Secret Santa exchange so everyone only has to buy one gift. Not only does this save you money, but it saves you time and stress since you don’t have to spend hours trying to find the perfect gift for multiple people. Use Elfster to keep your Secret Santa gift exchange under wraps! They take out the drama of setting up a gift exchange and selecting who buys for who and they make sure everyone gets something they really want with their universal wish list feature. Always compare prices and set sale alerts. Retailers are constantly fluctuating prices on popular holiday items so it’s important to compare prices to make sure you’re getting the best deal. To make this easier, use the ShopSavvy app for quick price comparison in store by scanning an image of the product’s barcode. When it comes to online shopping, download the Invisible Hand to your browser. The tool provides pop-up notifications when something you’re looking at online is available at another site for less. Also, Paribus will track prices of products you buy and will request price adjustments for you if the item goes on sale. Don’t forget to apply a coupon at check out. Many retailers offer coupons to use in store and online that can often be applied on discounted merchandise for deeper savings. You just have to know where to find them. First, sign up for retail newsletters for new subscriber coupons (i.e. GAP offers 25% off to new subscribers). Next, follow brands on social media for exclusive codes. A few months ago, for instance, I was able to unlock an exclusive 15% off code from hotels.com by liking their Facebook page. Then, fill up your cart and close out! Believe it or not, some retailers send coupons to entice you to complete the order you started. Another great tool is Honey. It’s a browser tool that searches for coupon codes and applies them to your online cart so you never miss a deal. Lastly, you can earn cash back for all your online purchases through Swagbucks and redeem points for gift cards to popular stores like Amazon, Starbucks and more! Get discounts on gift cards. Whether you’re planing to finish your shopping online or in-store, you can double the discount by using a discount gift card. Sites like ABC Gift Cards and others sell gift cards at a discount of up to 25% off. 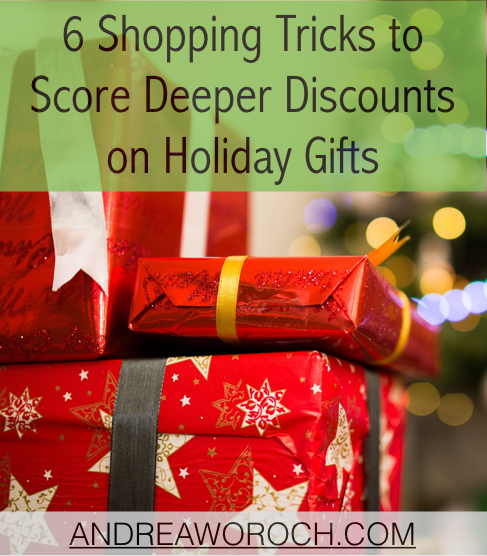 Use these on top of coupons and price matching to score a deeper discount. Examples: you can save over 10% on a gift card to Macys, over 5% on Toys R Us gift cards and 14% on Petco gift cards. Dodge shipping fees. If an online retailer is offering free shipping, make sure you don’t have to spend more to qualify for this perk. If they do, opt for free site-to-store shipping when available. You also want to review return shipping prices. Some retailers will offer free returns. If they don’t, make sure you have a physical location nearby to make it hassle free for yourself or loved one. Otherwise, you may want to shop else where. Pick up bundle gifts that are easy to break apart. Reduce your time shopping and save money by purchasing break-apart gifts like bundle sets of beauty items, candles or even toys. Such value sets will offer a lower price per gift when bought in a bundle and it’s a quick way to knock off multiple gifts off your shopping list at once. Don’t blow your money on gift wrap. According to research from Hallmark, Americans spend approximately $3.2 billion a year on wrapping paper. The best place to buy gift wrap is at the dollar store. You can grab 50-cent greeting cards and other inexpensive gift wrapping supplies like ribbon and bows, gift bags, wrapping paper and tissue. I suggest getting those in solid colors like red, green and gold because whatever is left over can be used for other celebrations through the year. When you’re tempted to purchase really cute holiday gift wrap, remember that it will just end up in the trash along with your hard earned money! If possible, save any gift bags and bow for next year once gifts are unwrapped and pick up supplies on clearance after Dec. 25.